Citation: Abam TKS, Oba T. Recent case studies of sand mining, utilization and environmental impacts in the Niger delta. J Environ Geol. 2018;2(2);64-7. The paper discusses the imperatives of sand mining and the environmental impacts using selected case histories in the Niger Delta and elsewhere. The continuation of sand mining in spite of the associated adverse environmental effects, have been linked to the creation of new usable land from marginal lands of the region and sustained supply of aggregates for expansion of civil infrastructure. The case studies highlight the project cycle of sand mining and the circumstances in which environmental peculiarities influence the procedures and strategies for abstraction. The major concerns of sand mining in the riverbeds and open sea are accelerated coastal and riverbank erosion, surface water turbidity due to re-suspended sediment load, threats to coastal infrastructure and the prospect of wider dispersion of contaminated sediments with extended effects on water quality, health and safety of marine life. The paper emphasizes the need to integrate mitigative measures of potential impacts into the planning and execution of sand mining projects.. Sand is needed for civil works, land reclamation, and industrial application. Sand is imported in places, such as Singapore, where sources are under stress or nearly exhausted. In Nigeria, large quantities of sand are utilized for construction and reclamation, particularly in the Niger Delta. In states such as Bayelsa, where 85% of the land area is periodically inundated by annual and tidal floods , land reclamation is imperative in order to sustain the supply of usable land for development. The availability of land for development is further limited, by the high density of the crisscrossed network of rivers and creeks, which effectively cut the delta into numerous small islands  and constrains expansion of island communities. The pressure on land in these communities creates the necessity to reclaim additional land from the backswamps, using essentially sandy materials dredged from the riverbed, seabed or Open Ocean. Land reclamation, using hydraulic sandfills has become gradually accepted as the most effective way (in terms of availability, cost, and aesthetics) to transform marginal land to usable land. Basic infrastructure such as roads and buildings are built on elevated embankments using sandfills to avoid being inundated. The need for sand utilization has been heightened by population growth, the drive toward rapid industrialization and the favorable price of oil and gas. An estimated 15 × 106 m3 of sand is dredged annually from the river channels in the Niger Delta. Sand mining is continuing, in spite of adverse environmental effects, because of the necessity for expansion of housing development and oil production infrastructure in marginal lands, and as a ready material source for construction, ground improvement and production of sandcrete and concrete. The principal agencies engaged in funding sand abstraction in the Niger Delta are the oil exploration and producing companies, State and Federal governments and its agencies (particularly Niger Delta Development Commission and Niger Delta Basin Development Authority), together with major construction companies. A major direct consequence of dredging river channels and open sea is the drastic alteration of the micro-ecology of sections of the river or sea from a typically shallow water habitat to a deep-water ecosystem. The concerns for the environment frequently make the choice of locations to dredge of crucial importance. The choice is governed by the need to minimize consequent adverse environmental effects. These effects could be wide-ranging, from physical to biological. Among the more common physical effects of dredging are lowering of river bed base-level, alteration of bathymetry of a river channel and changes in flow velocity . Others include; changes in river cross sections which according to Okagbue and Abam ; Abam and Omuso  often lead to bed and bank instability. Changes in sediment transport capacity and turbidity, shifts in saline and freshwater interfaces, changes in river morphology and disappearance of fish nursery and spawning grounds are the other less frequently reported effects. A subtle potential effect is groundwater salinization either through saline intrusion by shifting saline/ freshwater interface in dredged areas or infiltration from the placement of dredged marine sand. Although neither of these is commonly reported, but their possibility remains a source of concern. The testing of sand freshly dredged from saline river estuary  showed that salinity levels were within approved limits after two weeks of exposure to seasonal rainfall. Consequently, as a basis for a decision of a dredging location, it is imperative to provide an exhaustive inventory of resources at risk (both physical and biological) including the infrastructure at risk with a view to assessing the potential impact of dredging on the environment. Although the Nigerian Minerals and Mining Law of 2007: Part VI, Article 75, 76 and, above all, Article 123 and the Federal Ministry of Environment through the Environmental Impact Assessment EIA Act. 88 of 1992 provides for strict control of dredging operations, this is not so in practice. There is a misconception that dredging is not a mining operation because of the routine utility of sand. This is why dredging operations in states are mostly under the control of Ministries of the environment rather than the ministries of natural or mineral resources, thereby allowing only for the mitigation of environmental effects and not the potential threats to civil infrastructure. 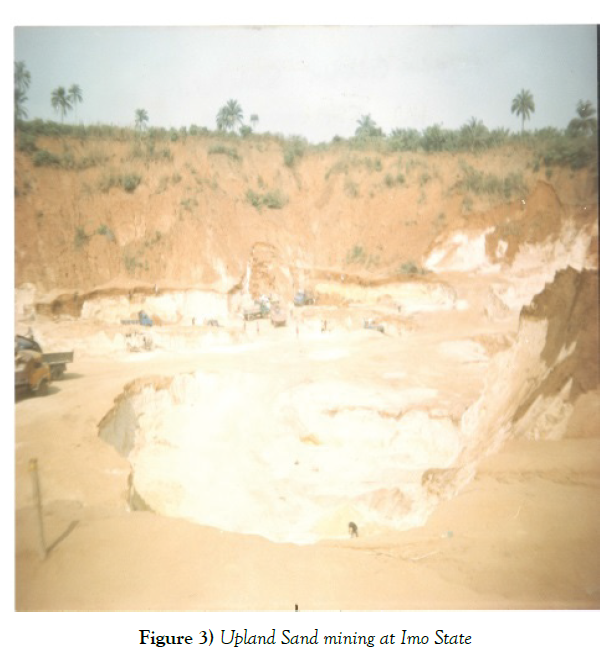 The geological formations in the area consist of the Quaternary sedimentary deposits, and the Tertiary Coastal Plain Sands generally referred to as Benin Formation (Figure 1). The Quaternary sediments give rise to alluvial plains. The alluvial plains include the estuarine sediments, which are under the influence of tidal brackish waters along the coast and in the estuaries of rivers and creeks. The Quaternary sediments also referred to as Benin Formation comprises an alternate sequence of bulky sand and clay as exemplified by Figure 2. The surface deposits in this area comprise silty and sandy- clays locally called laterites. These surface layers which are frequently thick (greater than 10 m in most cases) impact on the road and building foundations. The siltysandy clay is underlain by the sand that is often dredged, which exist in predominantly medium to coarse in grain sizes and mostly in the medium state of compaction. Rainfall in the region averages 2400 mm/annum and concentrated between May and October and results frequently in flooding. Sand search can be executed on land, along river channels and the open sea . The selection of sand-search technique depends on the location or point of utilization, the quantity of sand required, proximity to a river channel, cost provisions and environmental tolerances. In cases where the quantity of sand required is small and the distance to the river channel fairly long, pit borrowing of a nearby “waste” land can be carried out. This method is exemplified by burrow excavations in Ejimba area of Imo and Anambra (Figures 3 and 4) and can easily transform an area of scenic beauty to a wasteland with considerable environmental nuisance including generation of dust. However, if large quantities of sand are needed and reclamation or construction quality closely monitored, it is usual to explore for sand along river channels. Intrusive investigative tools (drilling and Cone Penetration Tests) are generally used in exploring for sand on land and over water in river channels or open sea. These techniques extract soils samples which can be tested for their geomechanical properties and used in reserve estimation. Drilling is sometimes complemented or augmented by penetration sounding with the cone penetrometers equipped with a friction sleeve jacket. The occurrence of sand is indicated by friction ratios less than 2.5. Shell and Auger Percussion and Wash boring methods are the most frequently used methods. Both motorized (Pilcon or Dando machines) or the locally fabricated percussion rigs “Swamp master” is used extensively in the Niger Delta. The ease with which these rigs can be dismantled and assembled makes them convenient for operations within the densely networked river systems of the Niger Delta . Drilling over water in rivers/creeks or open ocean utilize drilling barges, equipped with spud pins and are associated with greater risks. There have also been reports of using non-intrusive techniques such as Vertical Electrical Sounding and Ground Penetrating Radar for sand search on land due to their capacity to delineate geo-electric layers , but their results cannot compare adequately with those that intrude the soil. 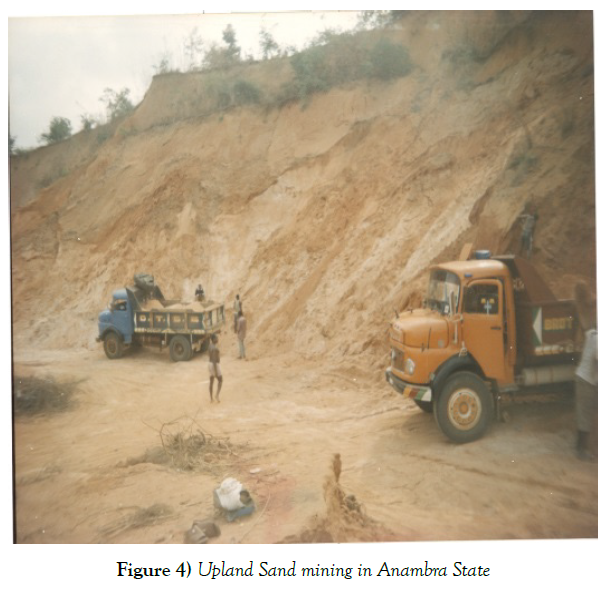 River Nun was dredged close to three communities, namely; Samabiri, Agbere and Odoni (Figure 5) in 1992 by the Oil Mineral Producing Area Development Commission (OMPADEC) in response to community desire for the creation of usable land. The dredging of sand altered the discharge distribution at the bifurcation of Niger River, instigating hydrological changes with impacts on land use and socioeconomic activities. 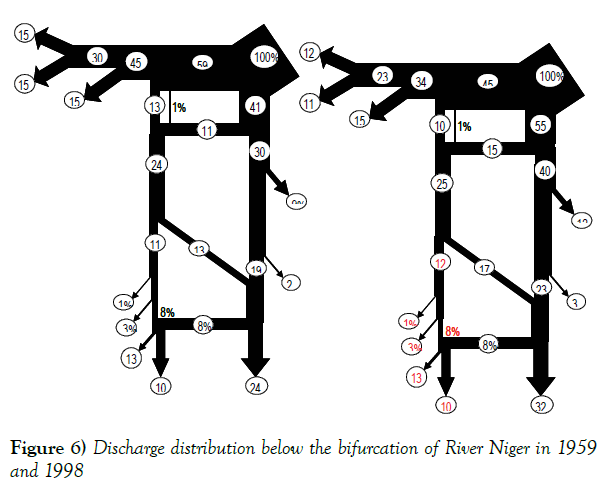 The Niger River discharge distribution between Forcados and Nun rivers by 1959 indicated that 59% was discharged through Forcados and only 41% through Nun River . Of the 41%, only 24% passed through the Nun River at the estuary, with 9% and 2% passing through Ekole creek and Igeibiri creeks respectively (Figure 6). However, after the dredging of a 2.5 km segment from Samabiri to Agbere/ Odoni by OMPADEC in 1992, the discharge distribution was altered. In an investigation conducted by Kariala consult , on behalf of NDES, nearly 8 years after this dredging, it was revealed that 55% of the Niger River volume at the bifurcation was discharged through Nun River post-dredging. The corresponding discharges through the Distributary Rivers were computed proportionately as indicated in Figure 6. The additional discharge through River Nun caused a higher frequency of floods, longer standing time and serious socio-economic disruptions in the subsequent years as confirmed by the World Bank study . The persistence of the new hydrological regime has instigated changes in land use and other socio-economic activities. The reduced discharge through the Forcados River, on the other hand, has been linked with the river sedimentation experienced since then. A power plant is sited on the floodplain of the Niger River, (near Onitsha) characterized by seasonally flooded freshwater swamps and underlain by a top 8m thick, firm to stiff silty clay and loose to medium dense sand. Roughly 12 × 106 m3 of sand was required for the creation of an embankment that effectively elevated the site above the maximum expected flood levels. 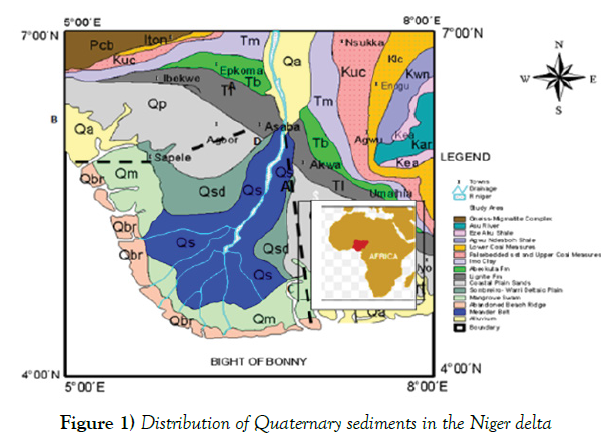 Substantial sand deposits were found at an economic distance in the adjoining river-bed of the Niger River during the soil exploration. The abstraction of such large quantities of sand in an ecologically sensitive area required additional considerations for the environment. Hence, the dredgeable average width of the river channel was limited to 200 m in comparison to a river width of about 350 m, to allow for the protection of sensitive banks against erosion. The sand was subsequently mined by hydraulic suction dredgers and transferred to the plant location which was roughly 1 km away. An embankment measuring 500 m × 500 m × 5 m (length × width and height) was created before the construction of ancillary facilities. The side slopes of the embankment were stabilized by grass, which dense root network strengthened and impermeabilized the soil. The placement of 5 m thick sand column over the compressible silty clay soil invariably induced consolidation settlement, resulting in the warping of the clay layer to form a basin. Following seasonal rainfalls, the trapped water level in the embankment rose to a dangerous level, thereby affecting the efficiency of site drainage and performance of the plant and ancillary equipment. A network of shallow pumped wells was designed and constructed to periodically lower the water level whenever it attained a dangerous level. The Beach Ridge itself consists of fine-medium-coarse sand that is mostly in medium to the dense state of relative density and considered ideal for the intended purpose. However, the mining of this sand presented serious ecological challenges. Firstly, it was considered that extraction of large volumes of sand would create large burrows which are likely to result in the breaching of the ocean with the attendant consequences of saline intrusion. Secondly, the geohydrology of the island would be severely altered depending on the method of abstraction to be adopted. The use of mechanical excavators under conditions of high water table prevalent in the barrier island would limit the quantity of extractable sand with associated problems of groundwater pollution. The dredging of the sand, on the other hand, would require large volumes of water for fluidizing the sand prior to suction. The abstraction and use of such large water volumes either from groundwater or open sea would inadvertently create a serious ecological problem of saline intrusion, vegetation kill and related adverse socio-economic challenges. The option of sourcing sand from the open ocean, on the other hand, was faced with short-term turbidity problem, disruption of biotic benthic live, short-to-medium term erosional problems and infringement on fishing rights and exclusion zones . The intensity of the turbidity is largely determined by the stratigraphy and composition of the seabed formations and the method of dredging. Finer sediments are easily re-suspended and remain in suspension over longer periods of time. 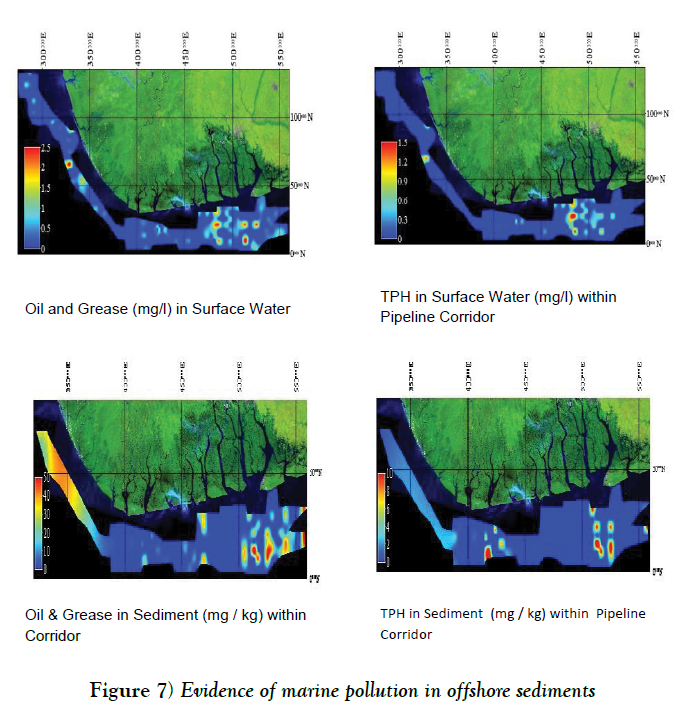 The long history of oil spillages in the Niger delta predisposes the region to widespread contaminated sediments as indicated by an EIA for an offshore facility by oil major in Nigeria (Figure 7). These sediments could be easily re-suspended during seabed excavation for pipeline placement, leading to further dispersion of contaminated sediments. Increase in turbidity for major dredging operations reaches over 300% of ambient levels . Such variations in turbidity are detrimental to phytoplanktons and fisheries. However, the impacts ascribed to turbidity are usually short-term and local and are cumulative with other activities. Sometime, it may become necessary to dredge offshore as it is commonly practiced in Europe and America. The major documented impacts of such activities relate to damage of micro-benthic life, excessive turbidity, alteration of wave and current climate and accelerated coastal erosion [5,14]. Model studies carried out by the Hydrological Institute, Wallingford, offshore Brass Nigeria (2006) predicted wave’s climate consequent upon dredging near shore. A typical example of the predicted alteration to the wave climate following the dredging of an offshore turning bay is presented in Figure 8. The predicted accelerated erosional impact on the shoreline corresponds to the point of intersection of the diffracted wave trajectory projected to the shoreline. The distribution and intensity of coastal erosion, on the other hand, are determined by the location and design geometry of the sand burrows. Burrows that are aligned parallel to the shoreline cause wave diffraction over a wider zone with a strong tangential erosive component, thereby causing shoreline erosion over a wider segment of the shoreline. When the burrows are tangential to the coastline, they may serve like canyons, trapping sediments entrained in the long-shore drift, thereby creating sediment deficit in the downstream part of the drift and ultimately causing shoreline erosion. 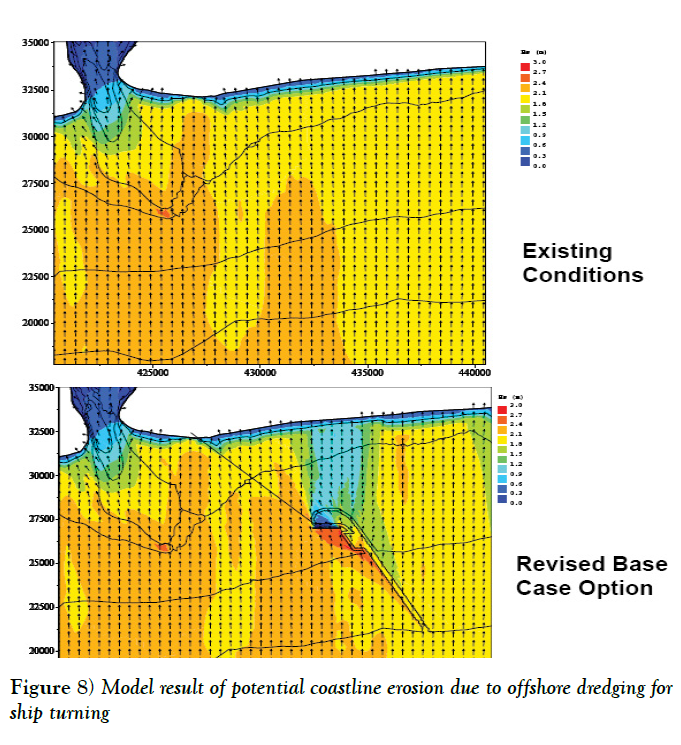 In this case, model results indicated distribution and extent of the anticipated erosion, thus making it possible to incorporate mitigative plans in the sand mining project . Sand search is vital to the success of dredging operations in the Niger Delta. A sand search exercise not only identifies and quantifies available sand; it should also assess and highlight the environmental challenges and dangers posed by its extraction. The case histories highlight the considerations and procedures that should ensure a successful sand mining operation in the Niger Delta region. These case histories also underscore the importance of integrating mitigative measures for potential adverse effects on the planning and execution of sand mining projects. Sand mining in river beds involving the excavation of large volumes of sand, especially at river bifurcations will inadvertently alter the flow dynamics of the river, with potential consequences for the flood. Therefore, a conscious effort must be made to redirect consequent flow away from sensitive and vulnerable banks and structures. Gobo EAT, Abam TKS. The 1988 floods in the Niger Delta: the case of Ndoni. J Meteorol. 1991;16:293-9. Allen JRL. 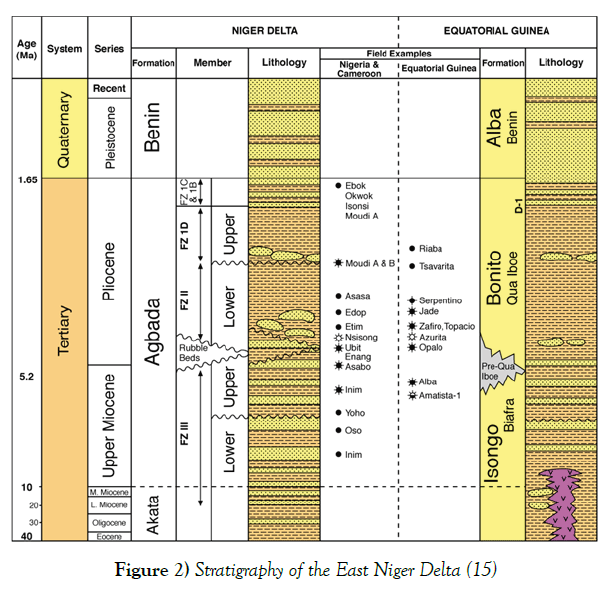 Late Quaternary Niger Delta and adjacent sedimentary environments and lithofacies. American Association of Petroleum Geologists. 1965;49:547-600. Niger Delta Environmental Survey (NDES). Potential impacts of the Niger River dredging. Unpublished report of the Niger Delta Environmental Survey. 1998. Okagbue CO, Abam TKS. An Analysis of Stratigraphic Control of River Bank Failure. Eng Geol. 1986;22:231-46. Abam TKS, Omuso WO. On River Cross-sectional changes in the Niger Delta. J Geomorphol. 2000;34:111-26. Abam TKS, Ofoegbu CO. Geotechnical quality control for the construction of large storage tanks in a marginal land: a case history Special Publication of the 8th Congress IAEG, Vancouver, Canada. 2000:4427-32. Abam TKS. 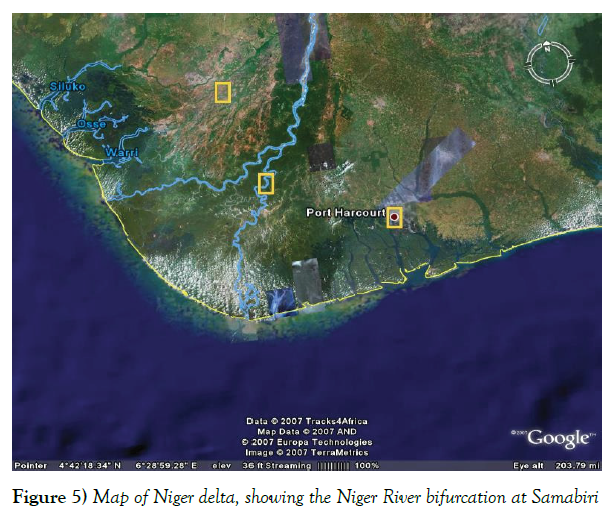 Case histories of sand search in the Niger Delta. Int J Geosci (Environ Geol). 2004;46:165-72. George EAJ, Abam TKS. Soil exploration strategies in the niger delta. proc of the region of Nigeria. Proc. of 1st International Conference on Constructions on Polluted and Marginal Lands, London Edt. by Forde MC. 1990:6-9. Abraham Bairu, Yirgale G, Gebrehiwot G. Application of vertical electrical sounding and horizontal profiling methods to decipher the existing subsurface stratification in river segen dam site, tigray, northern Ethiopia. J Environ Earth Sci. 2013;3(10). Nedeco. Water of the Niger. The Haque. 1961:239. World Bank. Defining an environmental development strategy for the niger delta.1995;1:150. Van Leussen W, Nieuwenhuis JD. Soil mechanics aspects of dredging. Geotechnique. 1984;34(3):359-81. Fisher R, Stark C, Ridd P, et al. Spatial Patterns in Water Quality Changes during dredging in Tropical Environments. PLoS ONE 2015;10(12):e0143309. Abam TKS. Bank erosion and Protection in the Niger Delta. Hydrological Science Journal. 1993;38(3):231-41.